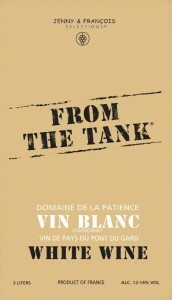 “From the Tank®” — high quality natural wine at a very low price that’s good for the planet too! “From the Tank®” was born out of the old school idea of going to the local winery with a big empty jug to fill up with easy-drinking juice. This is a tradition that stretches back for ages in France. 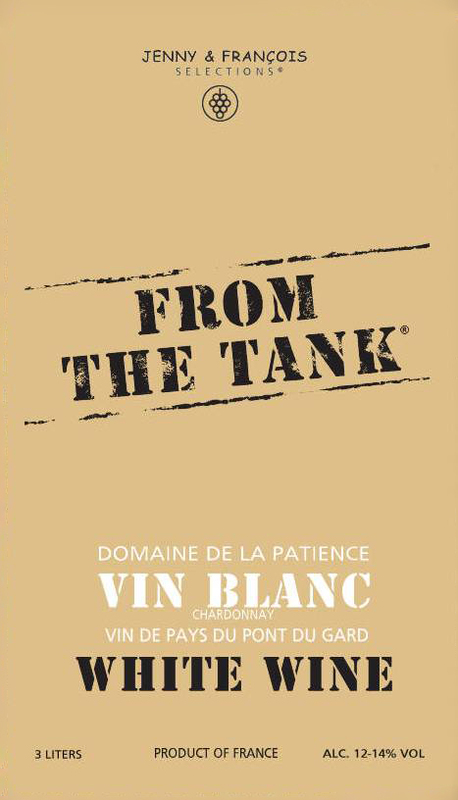 When we created “From the Tank®” , we were determined to source the highest possible quality grapes, grown organically or sustainably and hand-harvested, made only with indigenous yeasts and lightly sulfured, just like all the other wines we work with. What we created remains to this day unique in the marketplace of wine. A wine that tastes very natural, that can be purchased at retail for the equivalent of $8-$10 per 750ml bottle, in packaging that reduces green-house emissions, and is easier to transport and serve than traditional glass bottles. The lightweight makes “From the Tank®” perfect for a picnic, a party, or simply to carry home and put in the refrigerator. Vinification: Hand harvested. No external yeast and no enzymes are employed during the winemaking process. The bunches are de-stemmed and the fruit undergoes fifteen days of maceration. 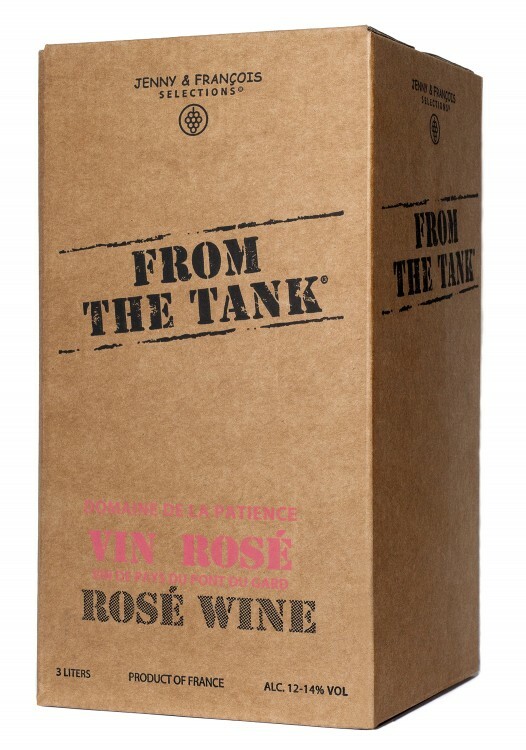 The wine is stored in enamel-lined tanks, and is bagged and boxed on demand. Tasting Note: Garnet in the glass with shimmering highlights. Elegant notes of smoky red fruit, violet, sweet herb and a note of baking chocolate. The palate is rich with ripe cherry and berry flavors, and a mineral note that is followed by supple acidity and velvety tannins. This is a very expressive red with a great concentration of fruit and yet it is never overly extracted. The wine finishes with floral notes and a dash of black pepper. 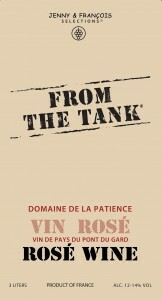 Vinification: Vinified in tanks and aged three months in concrete. 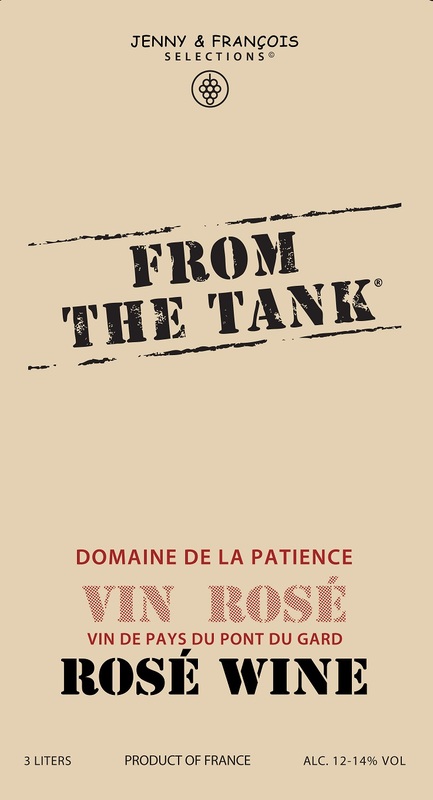 Vinification: This rosé was racked by bleeding, this is done by opening the base of the vat while the wine is still light in color. The wine undergoes traditional vinification without clusters, and is aged in concrete vat with minimum sulfur.